Beyond the basic economics of a new highway-to-highway bridge linking Detroit and Windsor, the Ann Arbor/Ypsilanti Regional Chamber says it’s an issue of Canadian quality of life. At a luncheon this past week attended by Roy Norton, Canada’s consul general, the chamber’s John Petz talked about the traffic congestion he’s witnessed on the Ambassador Bridge, which dates back to 1929 and spits off onto a local street in Windsor. Petz, who works in real estate and public affairs for Domino’s Farms, encouraged those in attendance to picture 8,000 trucks a day being dumped onto Washtenaw Avenue. Terri Blackmore, executive director of the Washtenaw Area Transportation Study, said Petz is correct in asserting that’s an overwhelming amount of truck traffic for a street like Huron Church Road, which she said might be more comparable to Liberty or Main Street in Ann Arbor. The A2Y Chamber first announced its support of the proposal for a second bridge to Canada last year and has continued to lobby for the project since Michigan Gov. Rick Snyder signed an agreement with Canadian officials in June. The chamber has submitted public comments in support of the so-called New International Trade Crossing to the U.S. Department of State. 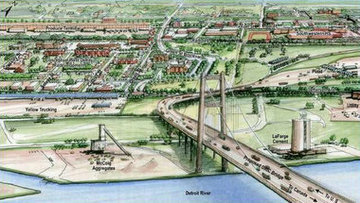 Petz pointed out the Detroit-Windsor crossing serves as the main funnel of trade between the two nations. He said he personally can attest to the traffic bottleneck that exits now. On a personal note, Petz said, he’ll be pleased when the new highway-to-highway span — roughly two miles down the Detroit River from the Ambassador Bridge — is built. The Michigan Board of State Canvassers on Monday voted 2-1 in favor of certification of a ballot proposal aimed at blocking construction of the bridge, but MLive.com reported the measure was kept off the ballot because it did not receive required bipartisan support. The proposal, backed by Ambassador Bridge owner Matty Moroun, would amend the Michigan constitution to require a public vote on any international bridge or tunnel project not completed by the end of the year, including the New International Trade Crossing. The People Should Decide, a ballot committee funded by Moroun companies, collected more than 600,000 signatures from Michigan voters in order to place the proposal on the ballot. The Morouns have been accused of grossly misleading television ads — funded to the tune of $10 million — claiming the bridge will cost Michigan taxpayers billions of dollars. Canada, which is bringing $550 million to the table, has agreed to cover Michigan’s upfront costs for the project and recoup investment through future toll revenue. It also has agreed to absolve Michigan of any liability for any part of the project, meaning the Canadians are taking all the risk, Norton said at the chamber luncheon.